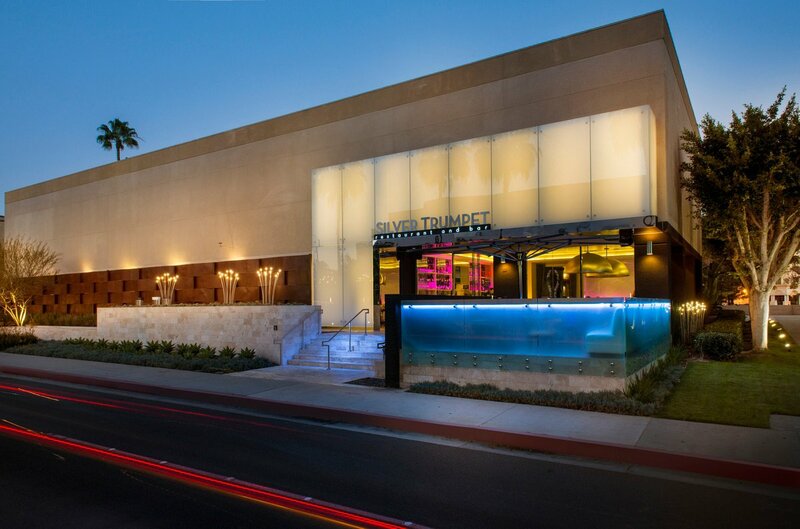 Avenue of the Arts Costa Mesa is fresh from a 2016 renovation, and features artsy, upscale design. It was previously a Wyndham and is now a Starwood Property and a Tribute Portfolio Hotel. The design falls right in line with fashionable SoCal thanks to a royal-purple-and-cream color scheme that’s visible even in its exteriors. Inside, the lobby has sleek black wood floors, large columns, grand tiered chandeliers, and seating areas with trendy canopy chairs and velour purple couches on cream rugs. The grounds are lovely too, with trees shading a green faux-grass patio filled with cushy padded sofas and armchairs. Heaters that resemble overblown decorative lamps and hanging string lights give these outdoor lounges an “Alice in Wonderland” twist. The restaurant is luxe with wooden floors, a brown-and-cream color palette, bronze chairs, and lovely views of the lake, while the bar is funky and fun, with white couches and chairs accented by purple and zebra-patterned pillows and bar stools. 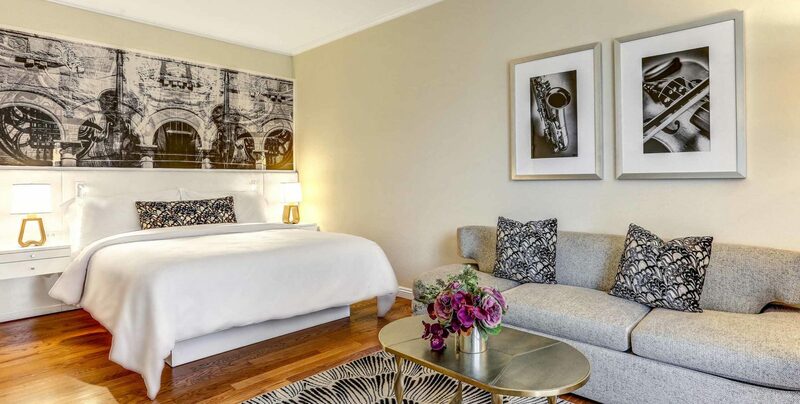 Overall, this stylish, artsy hotel draws mainly business travelers attracted by like the sleek design and business amenities, as well as some families, couples, and travelers seeking proximity to the airport. 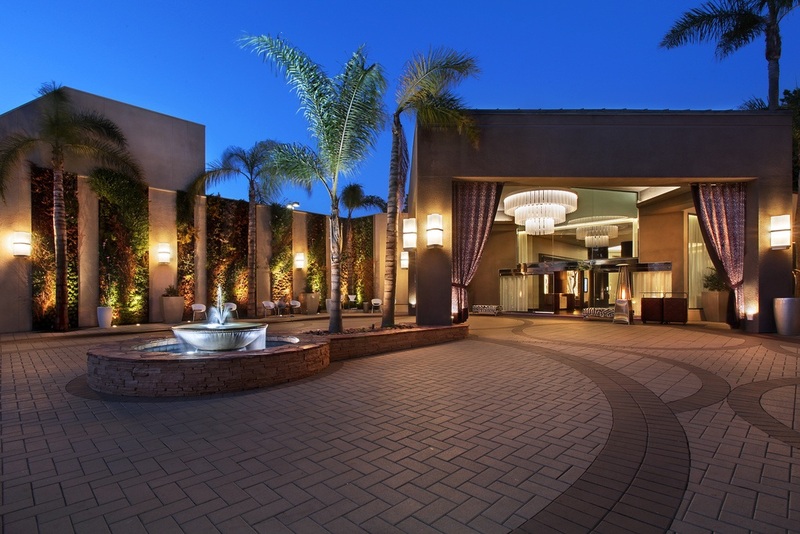 Avenue of the Arts Costa Mesa attracts travelers seeking proximity to John Wayne Airport, as it’s just a seven-minute drive away — plus the hotel offers a free shuttle service. 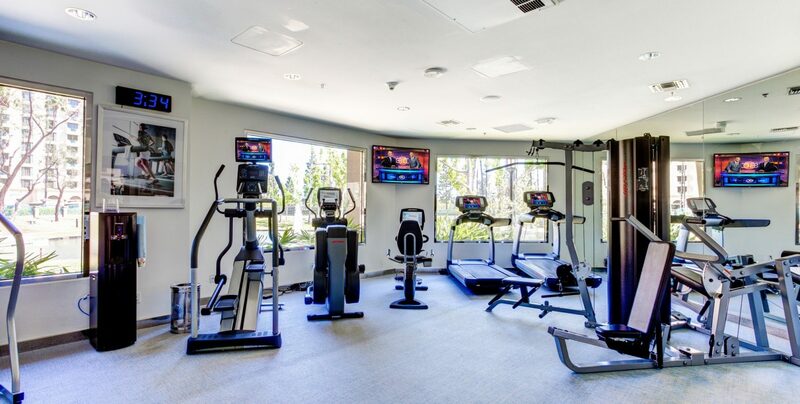 The property is located across from the Segerstrom Center for the Arts, an arts performance hall, while South Coast Plaza Mall is a 10-minute walk away. Other nearby attractions include Angel Stadium, which is about a 15-minute drive, and Disneyland, which can be reached in around 20 minutes. Nearby beaches like Newport Beach and Huntington Beach are about a 15- to 20-minute drive away. The immediate area has some restaurants and there’s a Starbucks around the corner. There’s a bus stop right in front of the property. Los Angeles International Airport is about a 45-minute drive, but it can take over an hour due to traffic. 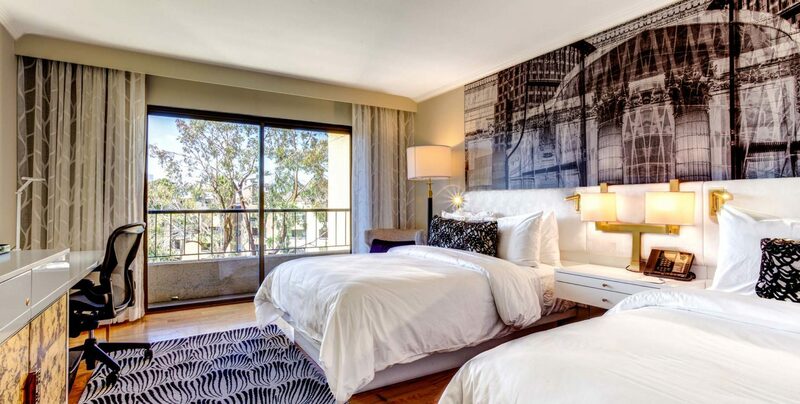 Rooms at the Avenue of the Arts Costa Mesa were renovated in 2016 to a stylish black-and-white design scheme. Wooden floors, white bedding, and white furniture create a sleek style, while patterned rugs and pillows add graphic punch. Giant photo murals also give an edgy artistic element. All rooms have desks with ergonomic chairs, while some come with gray couches or separate living rooms with trendy blue velour sofas. Amenities include flat-screen TVs, laptop safes, minibars, Keurig coffeemakers, and free Wi-Fi, though it can be spotty. Some have private balconies and views of the nearby man-made lake, while others have garden or parking lot views. The tan granite bathrooms are lovely, with large mirrors, walk-in showers, hairdryers, and Olivia Farmacia toiletries. 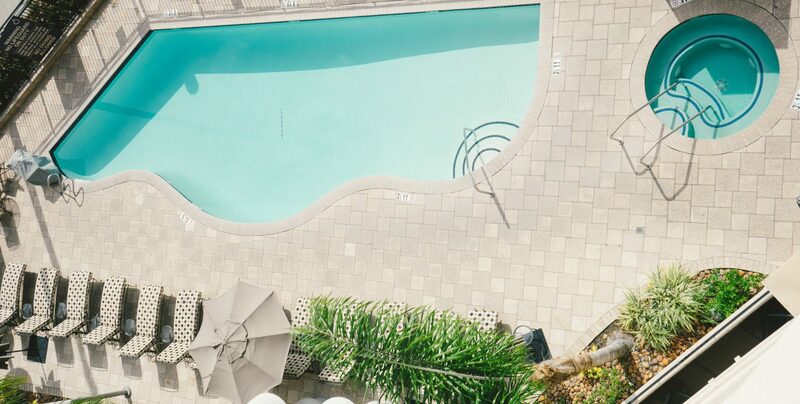 The standout feature of this property is its outdoor pool area, which includes a hot tub, cabanas, loungers, and poolside dining and drink service. Guests can also dine at the on-site Silver Trumpet Restaurant and Bar, which serves free-range and organic California cuisine, and has an outdoor patio with views of the nearby lake. It offers a breakfast buffet in the morning (for a fee) and 24-hour room service. The fitness center isn’t too big, but has Life Cycle Fitness equipment, flat-screen TVs, and free earbuds to listen to music or the TV. Though there’s no full-service spa, the hotel does have a sauna. 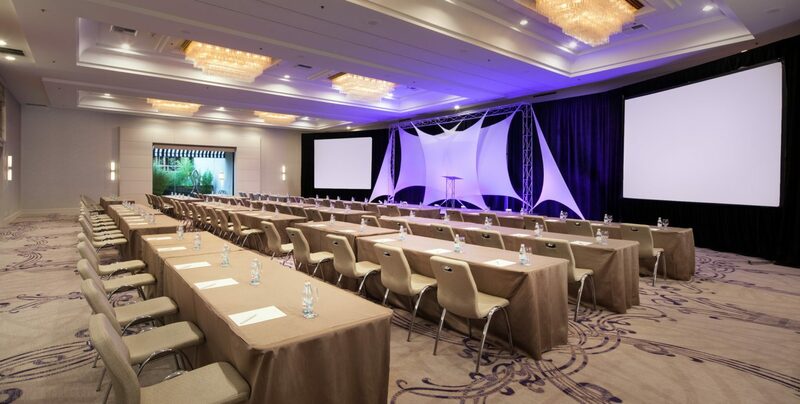 Six fully equipped meeting rooms are available, and there’s a great business center with multiple desktops and a printer. An on-site gift shop sells essentials as well as jewelry and knickknacks. Wi-Fi is free, but can be spotty, while parking incurs a daily fee.